This is Part Two of a three-part series on nuclear waste. Part One covered what it will take to clean up the mess left by the nuclear arms race. Part Three will illustrate how openness, accountability and trust can lead to effective actions to reduce present and future risks. What does "cleanup" mean when applied to nuclear materials production sites? How will we know when cleanup is successfully achieved? One might say "when the sites meet risk-based standards to protect human health." Assuming for the moment that everyone agrees on these standards, their views, nonetheless, differ dramatically about whether and when they can be met. There are two ways to deal with a contaminated area: One is to make the area comply — "clean it up," and the other is to isolate it from people and the surrounding environment through fences, guards, regulations and barriers. Any specific situation will find people supporting outcomes along a continuum from "greenfield," where no measurable contamination is left, to very restricted access and surface uses of the contaminated area. The toxicity and longevity of the contaminants vs. the cost and complexity of removing them. The extent to which the contaminants are contained vs. dispersed in soil and groundwater. Acceptable near-term risk, including risk to workers, vs. leaving some risks for future generations. The U.S. Department of Energy and its predecessors generated large volumes of solid and liquid wastes, containing both radioactive and hazardous chemicals, over decades of manufacturing fissile materials for nuclear weapons. Much of this waste has been contained in some way — placed in tanks or in containers stored above ground or buried in shallow landfills. The challenge here is to dispose of these wastes in a way that permanently isolates them from people and the surrounding environment. Meanwhile, large volumes of contaminants were not contained and now are spread through soil and groundwater. The challenge is to retrieve and contain these contaminants or, at the least, to prevent them spreading further into the environment. For example, the Department of Energy has exhumed materials dumped in shallow trenches and soil from contaminated drain fields and trucked these materials to new engineered disposal cells at Hanford, Wash., and Oak Ridge, Tenn. The department extracts groundwater through wells and then removes contaminants (pump-and-treat), such as carbon tetrachloride and chromium, before returning the water to the ground. There are generally less restrictive standards for occupational exposures (even with appropriate protections) than for exposures to the general public. The reasons for this are complex, but the key point in cleanups is this: Today&apos;s workers may be exposed to higher risks to reduce the potential for members of the public to be exposed to lower risks in the future. There may be no practical technical means to clean up a particular site to meet risk-based standards. In this case, some combination of physical — and institutional — barriers will be required. One may rely on physical decay of contaminants, future technological breakthroughs, or both, to make cleanup a reality some time in the future. Past experience suggests, though, that health standards will become more stringent over time. Surrounding communities and environmental activists are, however, very distrustful of arguments that technologies do not exist to remove contaminants from soil or groundwater, or that they are too costly. Their skepticism is based on the penchant of the Department of Energy and its predecessor agencies, which have been self-regulating, to ignore or cover up contamination problems. There are two basic approaches to long-term disposal of wastes, whether those already packaged or those retrieved in cleaning up contaminated tanks, buildings, soil or water. The more common — and certainly larger by volume — is "near-surface disposal" in engineered landfills. This assumes some level of active control for the foreseeable future. The other is to place the waste deep within geologic formations, which might uncharitably be termed "big holes in the ground," isolating them permanently from both human intrusion and from pathways to the environment where people live. The U.S. government&apos;s policy is: Long-lived radioactive wastes — some isotopes have half-lives in the tens of thousands of years — will go to deep geologic repositories. Shorter-lived wastes will be disposed in near-surface facilities with "active control" — i.e. extensive and labor-intensive human oversight — for 100 to 300 years. The latter case assumes that the material will no longer be particularly risky after active control fails or, if it is, future generations will continue to manage it. 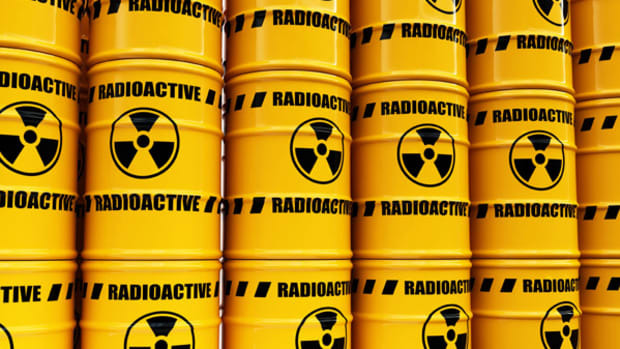 U.S. law also specifies deep geologic disposal for spent nuclear fuel from both civilian nuclear power reactors and defense production, as well as wastes from dissolving spent fuel to extract plutonium and usable uranium. Congress has determined that these materials will go to a repository under Yucca Mountain, Nev. Originally expected to open in 1998, this high-level waste repository won&apos;t begin operations at least until 2019. The Department of Energy submitted a license application for the Yucca Mountain repository to the Nuclear Regulatory Commission in June 2008. The problems that have beset repository development are more political and social than technical. Sites where wastes are set for near-surface disposal, or where dispersed contaminants are not cleaned up to meet standards for unrestricted use, require continued attention. In the world of DOE&apos;s nuclear sites, this has come to be called "long-term stewardship." The department estimates such stewardship will be required at more than 100 sites. Monitoring and maintaining the physical and institutional barriers that keep contaminants out of the environment and away from people. For example, are cement-like vaults or earthen caps over waste holding up? Are there holes in fences? Are monitoring instruments working? Are entry and land-use restrictions enforced? Maintaining and updating records in an accessible way. Identifying who will be accountable for these activities. Identifying how they will be funded into the future, given that the federal government cannot commit funds not yet appropriated by Congress. Assuring periodic review to determine if new technologies and/or new standards apply. State, local and tribal governments, and concerned citizens, want these tasks addressed up front when asked to accept waste disposal facilities or plans that leave contaminants in place. Entry and land-use controls, in themselves, are complex and often regarded as having limited effectiveness. The most popular example of their limitations is Love Canal, where duly recorded deed restrictions did not prevent building homes and a school atop a highly contaminated chemical dump. Physical barriers to isolate waste have yet to prove long-term performance. Redundancy is important, and skepticism is understandable.